Electromagnetic seismograph used at Eskdalemuir Observatory. The instrument was designed by Prince Boris Borisovitch Golitsyn (1862-1916). 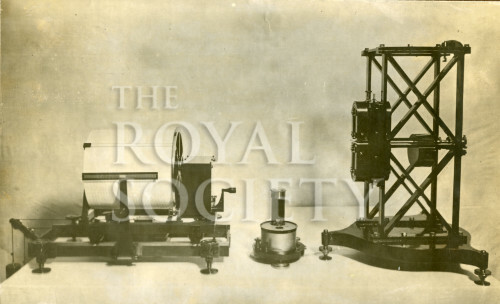 Captioned ‘Prince Galitzin’s Seismograph. Recording drum. Galvanometer. Boom & Magnets’. Albert Edgar Gendle (1886-1923) was Clerk Assistant to the Eskdalemuir Observatory until 1913, having worked as a boy at Kew Observatory. He then joined the Meteorological Office before becoming a lieutenant in the Royal Air Force in 1919. He was killed near Baghdad, Iraq, in 1923.